I think Matt is referring to the same Andrew Kliman who thinks a valueless fiat currency can express the socially necessary labor time required for production of commodities. But perhaps he is referring to another Andrew Kliman. Kliman is one of those imbeciles who thinks he is doing us a favor by defending Marx — as if Marx needs an imbecile like Kliman to defend him. It doesn’t matter what Marx was trying to do, says Professor Imbecile, if Marx argument contains an internal inconsistency. An argument that contains an internal inconsistency is no help in analyzing capital. Is this true? What if the process itself contains not one but two aspects, and what if these two aspects were in contradiction to one another — so that one aspect is expressed generally, while the second is expressed only as a “tendency”. This might happen, for instance, if the law of value were fundamental to the mode of production known as commodity production, while the law of the tendency of the rate of profit to fall, which operates only in capitalist commodity production, operated only as a tendency. In this case we would have to contradictory determinants of capitalistic prices of production: the law of value and the law of the average rate of profit. The contradiction between these two laws necessarily leads to the law of the tendency of the rate of profit to fall. An exposition on how capitalistic commodity prices of production form would then appear to contain an internal contradiction. The problem, however, is not in the exposition of the formation of prices of production as such, but in the capitalistic mode of production itself. What then is Marx trying to show? He is trying to show why commodity production must collapse much as he predicted in the Grundrisse. To show why it must collapse he has to show that capitalistic prices of production already contain the necessity for their own collapse. This is quite unlike Bohm-Bawerk’s aim, which is to explain market prices. In Marx’s exposition, market prices are already irrational from the beginning. They express a moving contradiction. Kliman isn’t even qualified to shine Postone’s boots. 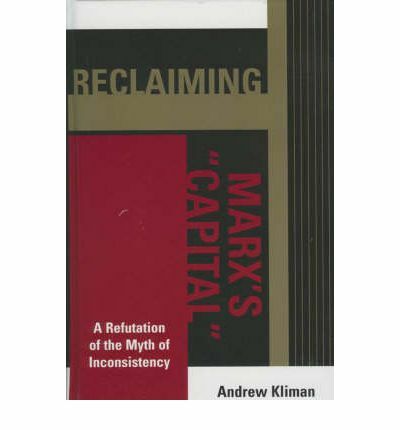 I haven’t read Kliman, but my understanding is that he’s not refuting Marx, he’s criticizing those that don’t defend directly against the “internal inconsistency allegations” well enough, worse, apologize for them under some kind of “Marx’s intentions” defense. In the paragraph above, it seems like he accuses Postone of doing just that. What’s his argument on how Postone did so? I don’t think either Grossman of Postone are low-hanging fruit, but I’d like to know if there exists any criticisms of Grossman from post-war Marxists? Do you know of any?